It is hard to find a city or town from Cheyenne to Evanston or Powell to Gillette in which smoke has not dominated the view. At least the sunsets and sunrises have been magnificent! Here in Lander, we enjoyed one clear day between all the smoke from the northwest to local smoke from the Little Bob fire on the Wind River Indian Reservation. They are letting it burn and it is over 1,500 acres and growing. Is this hell? Or is it Yellowstone? That was my exact thought as I piloted a small, single engine airplane over the vast expanse of Yellowstone National Park the first week of September, 1988, during the horrible fires that year. Flying with me on that day was Larry Hastings, one of the best pilots and instructors in Wyoming history. Also along and helping take photos was Mike McClure, a legend in his own right, as a premier photographer. Both men lived in Lander. We had been talking about making this flight for some time. It was my bright idea. We had seen TV coverage of the fire but no one seemed to have a good aerial view. I always want to figure out a way to take a big picture in the easiest way possible and flying over the park seemed the best plan. Hastings was aware of the altitude restrictions, which caused us to be quite high as we flew over the world’s oldest national park while it was literally burning up. The view was both impressive and unimpressive. It was impressive because as far as the eye could see was smoke. It was unimpressive because it was impossible to make out landmarks. Not even the mountains were very visible. What was visible were a large number of hotspots where fire would shoot 200 feet in the air. It was hot down there. The park I loved was going to be changed forever. That event two and half decades ago was unprecedented in the history of the National Park Service. There were contrasting programs of fire suppression and “controlled burns” in place, which caused the people responsible for the park’s existence to be incapable of dealing with the conflagration. Cities and towns in a wide circle around the park enjoyed the most colorful sunsets in history. Lander, which is a two-hour drive southeast from YNP, the evening views were unprecedented. It was an awful time for folks with respiratory problems. No wind and no rain could relieve these conditions. Fighting the fires in 1988 cost $120 million which is $230 million in today’s dollars – almost a quarter of a billion dollars. It covered some 800,000 acres or over one third of the park. Biggest fire was the North Fork fire, which was started July 22 by a cigarette dropped by a man cutting timber in the neighboring Targhee National Forest. One of the most amazing scenes of this fire was when embers from it were sent airborne across the massive Lewis Lake by 80 mph winds setting new fires on the other side of the lake. This complex of fires burned 140,000 acres and was finally extinguished when some welcome rains fell later that fall. Stories about other parts of the park and the valiant effort of more than 13,000 firefighters, 120 helicopters and other aerial devices, plus National Guard and civilians detail bravery but were to no avail. Important structures like Old Faithful Inn and the Lake Hotel were saved but efforts to stop the fires proved to be impossible. Mother Nature wanted that fire to burn and it did until she was ready to put it out. And that memorable day 27 years ago we were flying above a scene right out of Dante’s Inferno. I experienced a memory that I would both like to forget and yet, always recall. Check out Bill Sniffin’s columns at www.billsniffin.com. He is a longtime Wyoming journalist from Lander who has written six books. 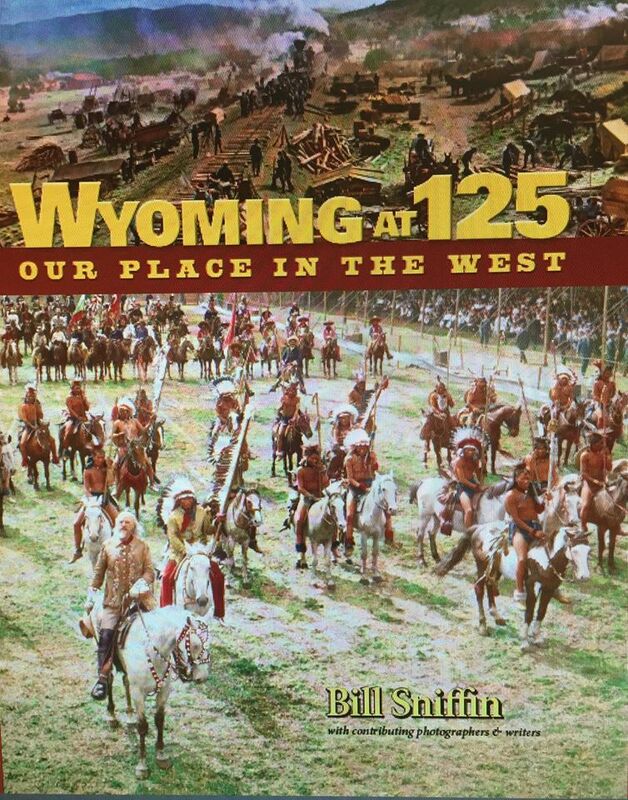 His newest is Wyoming at 125, which is coming out in September. His books are available at www.wyomingwonders.com. FROM THE PARKS: Fourth Graders Welcome at GTNP! MOOSE, WY — Grand Teton National Park invites all fourth-grade students to visit the park for free as part of the White House’s new Every Kid in a Park program. Fourth-grade students can visit https://www.everykidinapark.gov/ to complete an activity and obtain a voucher for a free annual entry pass to more than 2,000 federal recreation areas and lands, including national parks. Grand Teton National Park Superintendent David Vela said, “We invite all fourth graders and their families, as well as fourth-grade classes, to the park to discover, learn and have fun.” Vela said one of the goals of the program is to connect young people with the great outdoors. 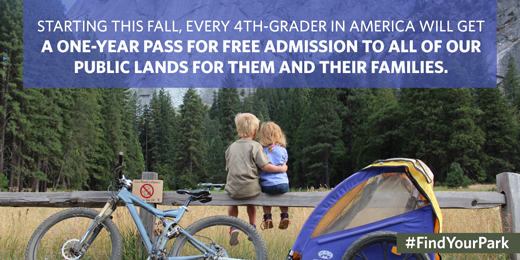 To receive a voucher for their free pass for national parks, fourth graders can visit the Every Kid in a Park website and play a game to access their special voucher. Fourth graders and their families can then obtain a pass for free entry to national parks and other federal public lands and waters across the country from now through August 31, 2016. The website also includes fun and engaging learning activities aligned to educational standards, trip planning tools, safety and packing tips and other important and helpful information for educators and parents. In addition to providing every fourth grader in America a free entry pass for national parks and federal public lands and waters, fourth grade educators, youth group leaders and their students can participate in the program through field trips and other learning experiences. Grand Teton National Park offers a “Weather Wonders” snow science field trip for fourth-grade classes and geology field trips in the fall and spring. The distance-learning program “Snow Desk” broadcasts live to schools around the country during the winter. Park personnel will be at Colter Elementary in Jackson Hole to share information at the fourth-grade parents’ night on Wednesday, September 16 from 6-7 p.m. Other schools and fourth-grade teachers that are interested in the program should contact Megan Kohli at grte_education@nps.gov or call 307-739-3656. Information about additional educational opportunities with Grand Teton National Park such as curriculum materials, field trips, traveling trunks, distance learning and more is available at http://www.nps.gov/grte/learn/education/for-teachers.htm. Every Kid in a Park is a government-wide effort, launched by President Obama, and supported by eight federal agencies, including the National Park Service, the Army Corps of Engineers, Bureau of Land Management, Bureau of Reclamation, Department of Education, Fish and Wildlife Service, Forest Service, and National Oceanic and Atmospheric Administration. January 7, 2015 (Jackson Hole, WY) – Snake River Sporting Club, Jackson Hole’s premier private club and residential community, is partnering with Orvis and Jackson Hole Fly Fishing School to host the newly launched Orvis Fly Fishing School – Jackson Hole, the renowned outfitters first such school in Wyoming. A series of 10 two-day intensive classes, combining classroom programming and “on-stream” instruction led by Orvis Fly Fishing Instructor Spencer Morton, will be open to fly fishing enthusiasts from around the globe. Starting in July, the two-day courses run throughout Summer and Fall 2015 offering an in-depth exploration of fly fishing fundamentals and techniques, including tying essential knots, choosing gear and tackle, proper fly selection, reading water and currents and general entomology. Taking advantage of the Club’s premier and private access to six miles of Blue-Ribbon fishing on the Snake River, each student will receive an exclusive hands-on lesson with personalized attention from an expert instructor, for both beginner and expert levels. Pricing is $489.00 per student and includes use of top-notch fly fishing equipment and meals at the Snake River Sporting Club’s Clubhouse. A full schedule of school dates is available at www.orvis.com/schools. Just one year after reopening, Snake River Sporting Club thrives as Wyoming’s foremost outdoor adventure playground, following a multi-million dollar reinvestment plan by new ownership group, Atlanta-based Cygnus Capital. The Club now has more than 175 members who can enjoy a variety of new and updated amenities, including the completed 26,000 sq. ft. Clubhouse facility, restored Tom Weiskopf championship golf course, new Equestrian Center and a variety of outdoor sporting activities such as 3D archery, shooting clays and more. A collection of turnkey luxury cabins was completed in summer 2014 and sold within four months of hitting the market, resulting in current construction of additional real estate, per member demand. To enroll in the Orvis Fly Fishing School – Jackson Hole, please visit www.orvis.com/schools or call (866) 531-6213. For more information on Snake River Sporting Club, please visit www.snakeriversportingclub.com or call(307) 200-3114.